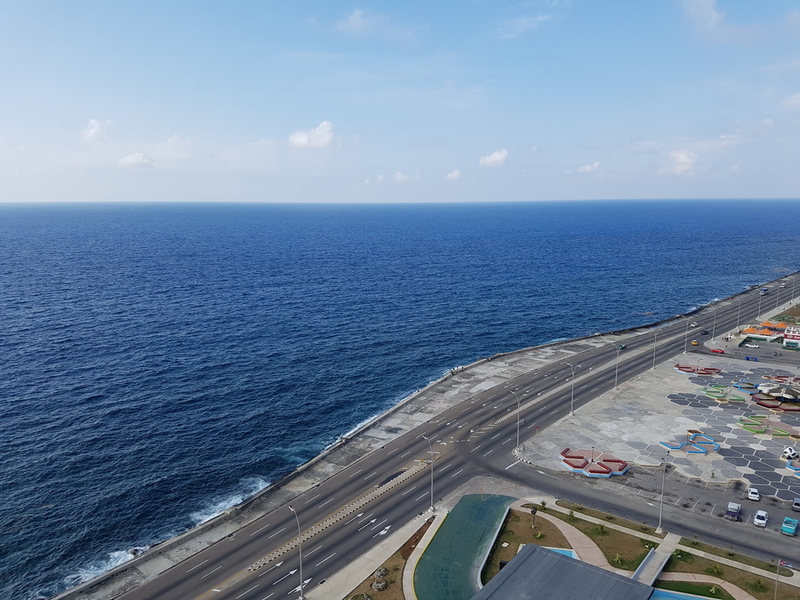 The Malecón is an eight-kilometre promenade and seawall, built in stages between 1901 and 1952 with the express purpose of protecting central Havana from the sea. Quite apart from being a worthy feat of civil engineering, the Malecón is famous for the unique role it has come to play at the heart of Havana’s social life. From the skyscraper-bristled district of Vedado in the west to Havana Harbour in the east, it's been dubbed 'the world's longest sofa' and serves as a second home for friends, lovers, dreamers, artists and hunters alike. I get my first good look at the Malecón from my room on the thirteenth floor of the Hotel Habana Riviera – a living fossil from the 1950s, built by the American mobster Meyer Lansky. The gangsters have left the building, but its décor seems thrillingly unchanged. Through the window, I see groups of people under the streetlights, chattering, jostling. I hold my ear to the window and hear hints of a guitar strummed hard with fingertips. The next afternoon, I find the Malecón drowsing in a heat haze, a band of grey between the dark-blue Atlantic and a road striped with technicolour-bright vintage cars. A few hundred meters’ walk from the Habana Riviera, Giraldo is leant up against the seawall, as if in imitation of the fishing rod beside him. I introduce myself and ask him what he hopes to catch here. “You can catch all sorts of fish here,” he says. “It’s a great place to fish in the afternoon. I’ve caught picudas, morenos… once I caught a shark. Some other guys came and helped me get it ashore, right over there where you were walking.” He tells me I’m unlikely to see something quite so big landing today. Keen to find out about the social side to the Malecón – the side I glimpsed last night – I ask Giraldo if he’s made any friends here. “How couldn’t you?” he replies. I say goodbye to Giraldo and walk on, past a group of handline fishers with their baits scattered across the concrete, heading towards the Monument to the Victims of the USS Maine – an American naval boat mysteriously sunk here in 1898. The American eagle that originally ornamented the monument was taken down by anti-imperialists in 1961, but it remains a fine tribute, with Grecian columns reaching skyward and the figure of a woman looking out to sea, towards the Florida Keys. She’s looking over the shoulder of Manuel, who I find sat on the seawall holding a carton of juice. There’s not a fishing line or guitar in sight. “I come here for the sea – it relaxes me,” says Manuel. “I’m a religious man, and I like to come here and think.” He sips his juice. He’s keen to know what I make of Cuba. Me encanta, I say. I’m getting close to Old Havana now, where the streets are narrower and busier. The sharp sounds of passing cars are flattening into a steady roar and the air smells of petrol. Many of these cars, incidentally, would turn heads on a British high street, by dint of either beauty or apparent unroadworthiness. Two women are dangling their legs off the edge of the seawall, facing away from the traffic. Their names are India and Barbara, and I’m soon confirmed in my suspicion they’re related. Barbara smiles in affirmation. “We’re here because we like the Malecón and the sea. It’s a good place to talk and to think,” she says. As I make to leave, India leans over and warns me against returning to the Malecón at night: “Bad people come here.” Perhaps naively, I find it hard to imagine. As I walk the last mile-or-so to the Old Town, I continue to encounter Habaneros with their own particular connections to the Malecón. I meet an artist making pencil drawings of passing cars, who tells me he comes here to get away from his problems. A Jehovah’s Witness pushing a trolley bids me buenos días, waves an evidently holy book in my direction and asks me for 5 CUC. Close to the tourist hotspots of Old Havana I find buskers, some playing Cuban standards, others adlibbing lyrics about passers-by. At the foot of the Castillo de San Salvador de la Punta – a 16th Century fortress which has lately come to mark the Malecón’s eastern limit – I turn back to look across the curve of the promenade. Though the fishermen, the lovers and even the Habana Riviera are now out of sight, that shimmering grey line sings their stories all the louder.